The Roundup Ready 2 Xtend® soybean and Bollgard II® XtendFlex® cotton cropping systems offer resistance to both Roundup® and dicamba herbicides. XtendiMax with Vapor Grip Technology is a straight dicamba product. This product provides a powerful solution to control glyphosate-resistant and tough-to control broadleaf weeds. Maximum drift control is especially key for the successful application of dicamba products. 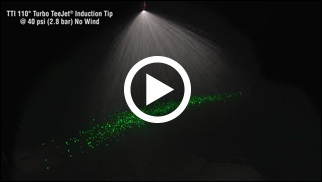 Monsanto is recommending several TeeJet spray tips for dicamba application – including multiple sizes of the Turbo TeeJet® Induction (TTI™), as well as Air Induction (AI) tips. The TTI is a proven, reliable spray tip developed specifically with drift reduction in mind. It produces Extremely Coarse (XC) and Ultra Coarse (UC) droplets across a wide pressure range, for the ultimate drift control. Additionally, this spray tip generates less than 2% driftable fines* – one of the very lowest driftable fines percentages of all spray tips available today. With several sizes of TTI spray tips approved, across a wider operating pressure range than other tip series, the TTI gives you the flexibility to spray at the speed you want. So, if you plan to apply XtendiMax Herbicide With Vapor Group Technology and want the best possible drift control while maintaining top productivity, choose the TTI spray tip. Please contact your local Authorized TeeJet distributor today to place an order. Visit https://www.roundupreadyxtend.com/Pages/default.aspx to learn more. *TTI11004-VP spraying water at 40 psi and 70ºF in a laboratory setting. Driftable fines are defined as droplets of 150 microns or smaller. Bollgard II, Roundup, Roundup Ready 2 Xtend, XtendFlex, XtendiMax and Vapor Grip Technology are trademarks of Monsanto Company.